Corporate Tax Reforms: Grade A. It is economic malpractice that American businesses have remained subject to an outdated 1986 corporate tax code, and a fossilized 1960s international tax system. Since 2000, 33 of the 35 OECD countries have cut their corporate tax rates from an average of 32 percent to 24 percent, while the U.S. has stubbornly clung to an exorbitant 39 percent rate including state taxes. In a global economy, where companies can choose where to produce and invest, these tax rates have chased countless companies and trillions of dollars overseas. Furthermore, the United States has remained one of the last countries on earth with a “worldwide” tax system that requires its multinational companies — which already pay taxes to the country in which they are located — to face a second layer of taxation when they repatriate profits. Instead, many companies leave profits and investment abroad, creating the worst of both worlds: a stratospheric tax rate that ultimately raises little tax revenue from multinationals. The Tax Cut and Jobs Act finally brings the U.S. corporate tax system into the 21st century global economy. The corporate tax rate will decline to 21 percent (25 percent including state taxes). The worldwide tax system will be replaced with a territorial system in line with our global competitors. Because business investment is 88 percent correlated with job growth, this bill allows businesses to deduct fully the new cost of new investments (with a gradual phase-out after 2022 that Congress will likely cancel). In return for these improvements, corporations will face a mild reduction in tax deductions — led by a limitation in their ability to deduct interest expenses — and multinationals will face a significant one-time “toll charge” on overseas profits. These are a small price to pay for a historic modernization of the corporate tax code. These corporate tax reforms would have earned an A+ grade had they made full business expensing permanent, more aggressively closed loopholes to offset their cost, and better limited the inevitable business confusion that will arise from implementing such complicated policies so quickly after enactment. Still, this pro-growth corporate tax earthquake earns an A grade. Family Tax Reforms: Grade C+. On the family tax side, lawmakers have produced more motion than progress. 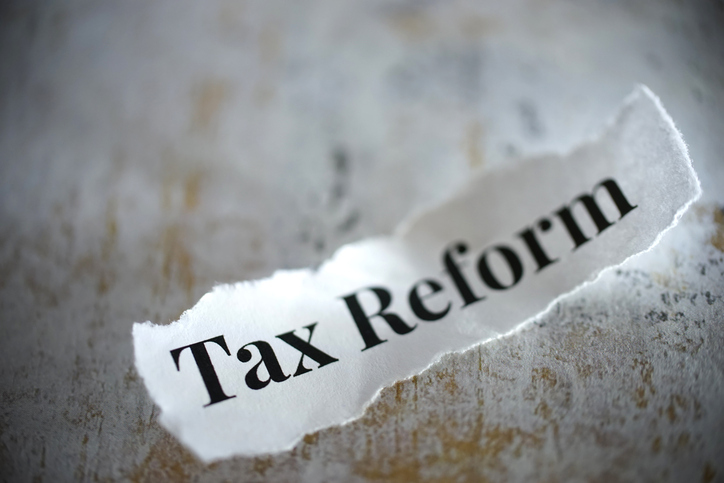 For decades, tax reformers have described the vast benefits of broadening the tax base and lowering the tax rates — or more specifically, obliterating the endless list of complicated, anti-growth tax loopholes and preferences, and then applying the savings to lower tax rates for all. Instead, tax reformers learned that Americans love their tax preferences. No significant individual income tax preferences are eliminated. The deductions for mortgage interest and state and local taxes are only modestly pared back. Consequently, tax rates are trimmed only slightly, while the child tax credit doubles to $2,000. Some simplification results from nearly-doubling the standard deduction, which will now be used by nine out of every ten taxpayers – and thus eventually shrink the constituency for retaining the itemized tax preferences. Upper-income families can expect modest simplification from scaling back — but unfortunately not eliminating — the Alternative Minimum Tax. The net effect is a roughly across-the-board tax cut. The typical median-income family will save approximately $900 per year. And while the wealthy will save more in absolute dollars — because they pay the most taxes — the tax cuts nudge the tax code in a more progressive direction. The bottom 80 percent of families currently pay 33 percent of all combined federal taxes, yet will get 35 percent of the tax cuts. By contrast, the top one percent currently pays 27 percent of all federal taxes, but will get just 21 percent of the tax cuts. This means the share of all federal taxes paid by upper-income earners will slightly rise. The 2025 expiration dates for most family provisions are potentially problematic. When the time comes, Congress will surely vote to extend permanently the middle- and lower-income provisions, yet the cuts to the estate tax, AMT, and upper-income marginal tax rates are not guaranteed to survive. These assumed-extensions raise the ten-year static cost from $1.5 trillion to $2.0 trillion. Thus, lawmakers could have better reflected their will by simply setting the tax target figure at $2.0 trillion over the decade, and by writing a 30-year budget resolution to avoid having the Byrd Rule enforce deficit-neutrality after year ten. Instead, the fake expirations allow critics to demagogue the eventual “broad-based tax increases” that are highly unlikely to occur. Overall, the family tax reforms reflect a marginal improvement and a major missed opportunity. Other Reforms: Grade B-. In a perfect world, the ObamaCare individual mandate would be repealed as part of comprehensive health reform. However, its elimination in tax reform will still grant millions of Americans the freedom to shop around for non-ObamaCare health plans that are better tailored to their needs, at a lower cost. It may also motivate Congress to revisit ObamaCare replacement legislation in 2018. The estate tax double-taxes wealth that had already been taxed when it was earned, and also imposes an enormous administrative burden on affected families while raising little federal revenue. Although scaling it back is helpful, lawmakers should have kept their pledge to eliminate it. That additional cost could have been offset by taxing inherited capital gains, currently virtually tax exempt. Corporate tax cuts also create a need to extend tax relief to pass-through businesses. Unfortunately, the 20 percent deduction for pass-through income is ripe for abuse, as families and ineligible businesses will work to reclassify themselves as eligible small businesses. Even successful guardrails against abuse will bring significant new tax complexity. Cost: Grade D. Tax reform was originally intended to be deficit-neutral. The final cost of the Tax Cut and Jobs Act — after stripping fake expiration dates, and incorporating a reasonable estimate of growth revenues — should approximate $1.0 to $1.5 trillion over the decade. The vast majority of this cost comes from the family and small business provisions. Critics are wrong to say that these tax cuts will be a primary driver of future budget deficits. In reality, they will raise the ten-year budget deficit from $10 trillion to $11.5 trillion. If fully extended, they would push the projected 30-year budget deficit up from $78 trillion to perhaps $85 trillion. Social Security and Medicare system deficits drive the rest of the long-term deficits. Still, the tax cuts worsen the deficit problem. And they poison the well for the entitlement reforms that are needed to avert long-term catastrophe – and to sustain any tax cuts. Lawmakers must learn to make the difficult decisions to rein in rising deficits, and the Tax Cut and Jobs Act did not take advantage of potential savings. Process: Grade B-. Lawmakers deserve credit for beating the odds and getting tax reform to the finish line for the first time in 31 years. Tax reform was also passed under regular order, through the committees of jurisdiction. On the other hand, trying to rewrite the most complicated portions of the tax code in a matter of months is a recipe for confusion — especially since the law will take effect almost immediately after enactment. By contrast, the 1986 tax reforms took two years to craft and negotiate. Lawmakers should expect a lengthy technical corrections bill in 2018, with a lot of messy confusion and unanticipated consequences for families and businesses in the meantime. Additionally, while a more bipartisan process would have brought more sustainable and widely-accepted reforms, it is unclear that a true bipartisan path existed in this hyper-political environment.